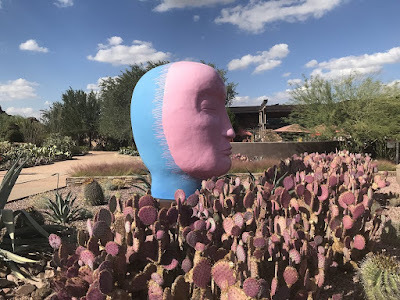 Denis and I spent the afternoon at the Desert Botanical Garden last Thursday, and we saw so much that I just have to share. Monday I posted about the Dia de los Muertos Offrendas exhibit at the Webster Center, and today I'm going to share a few photos Denis and I took of some of the large ceramic sculptures that are placed throughout the garden until next May. 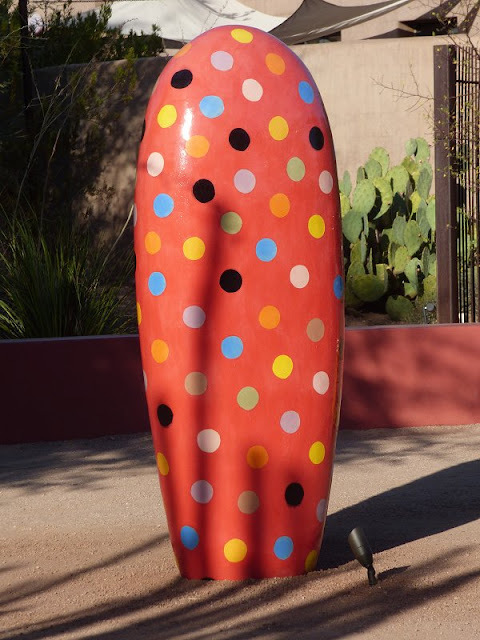 Jun Kaneko is an internationally renowned artist who specializes in large-scale, hand-built, ceramic sculptures. 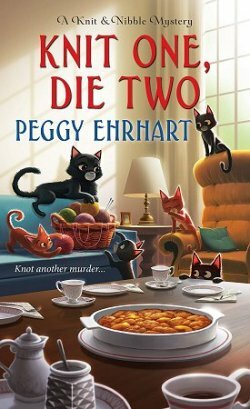 I tend to be the sort of person who likes my art to be realistic-- when I look at something, I want to be able to see immediately that it's a house or a dog or a crowbar. 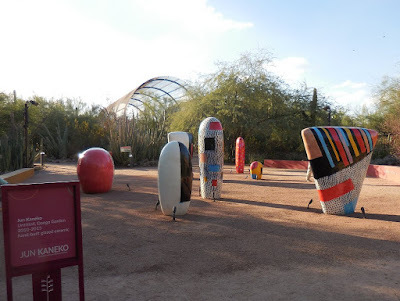 Kaneko's art is not representational, but as I wandered through the Desert Botanical Garden, his sculptures' shapes and bright colors made me smile. 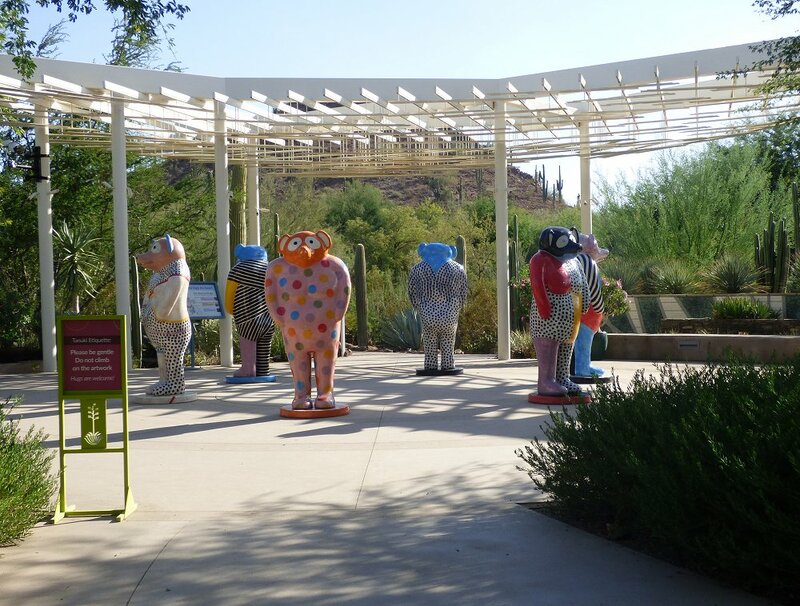 I was pleased to see how well they fit in their desert surroundings, too. As I was going through the photographs we took, I also learned a couple of new words. "Dango" is a type of Japanese dumpling, and "tanukis" are Japanese raccoon dogs. 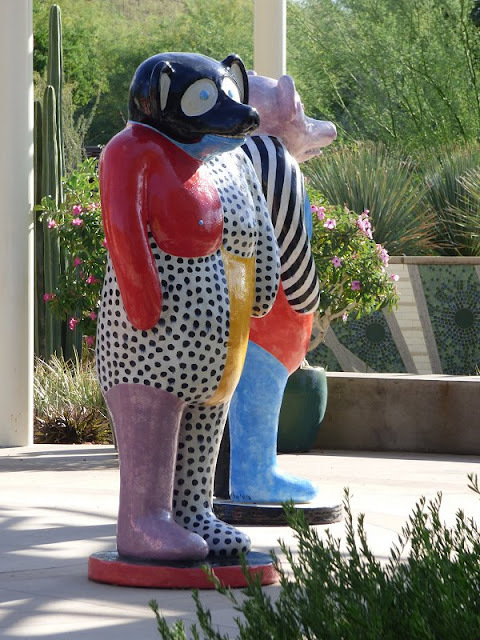 I hope you enjoy your wander through the garden-- and that the sculptures make you smile, too. Click on any photo to have a new window automatically open so you can see it full size. 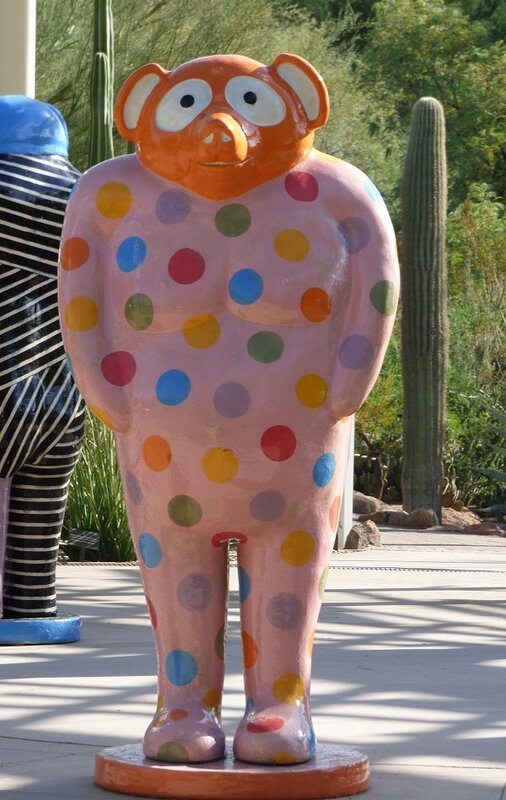 There are also links in two or three of the captions that will lead you to Kaneko's website if you're interested in seeing more of his art. 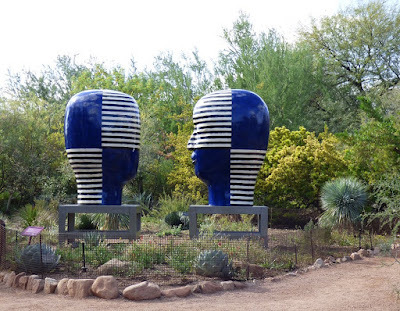 There are forty Kaneko sculptures in the Desert Botanical Garden. I'd like to go back to see the rest of them! 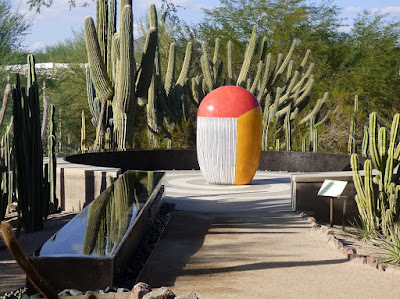 If you ever visit the Phoenix area, I hope you take the time to visit the Desert Botanical Garden. 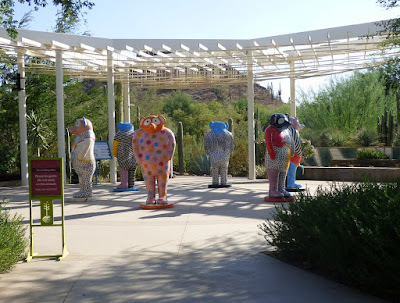 Art, plants, restaurants, wildlife...it's a wonderful place to spend many hours! Oh, these are gorgeous, Cathy! I love how bright and 'alive' they are. 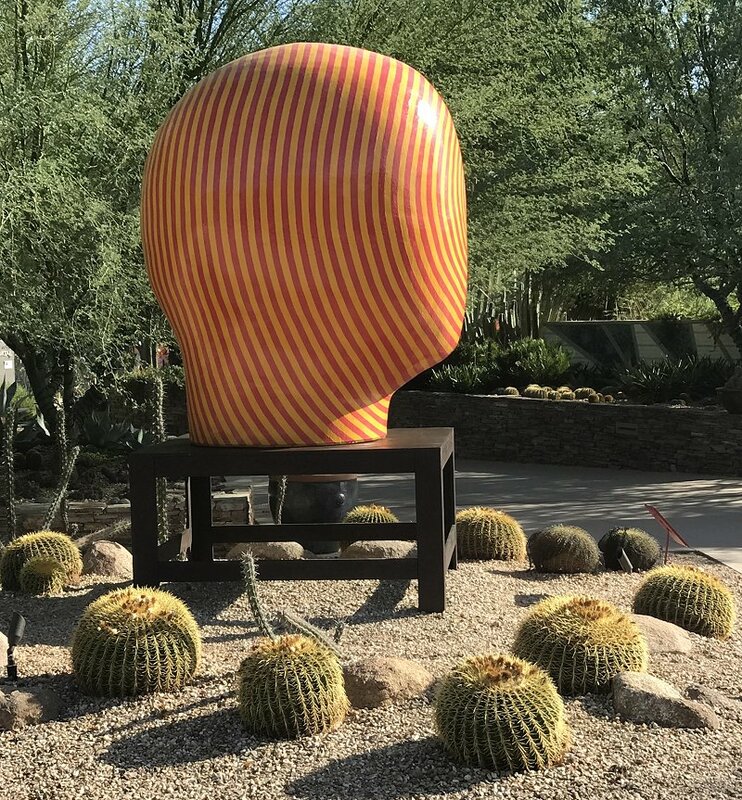 It must have been amazing in person. Interesting! I've never seen sculptures like these before. Like the Tanukis and the Dangos, the colors, unusual shapes. 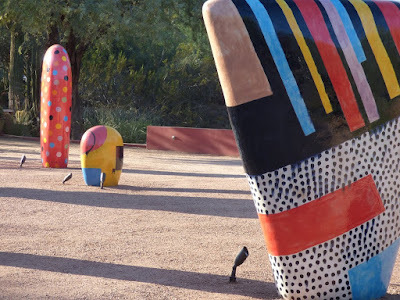 Maybe they symbolize something in the culture. I'm not usually one to like abstract art, but I like these. 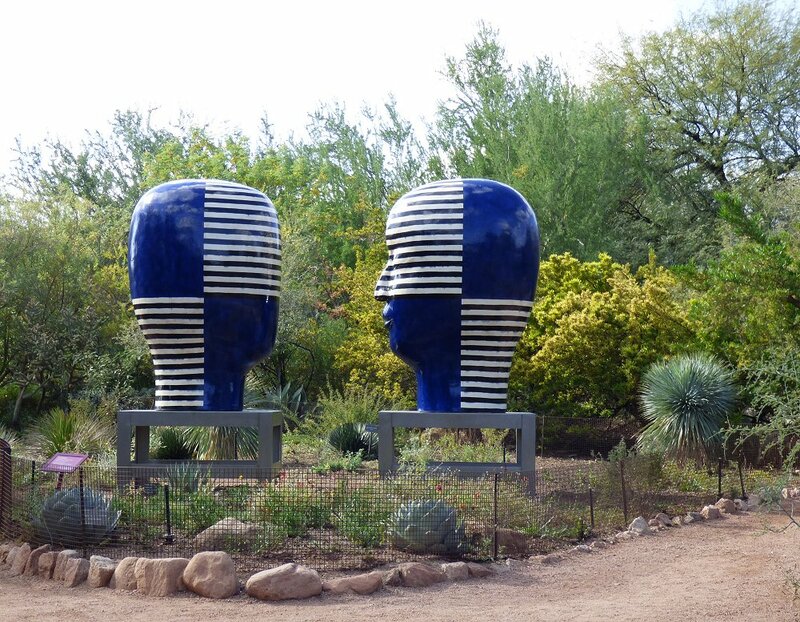 Am glad they are in the Botanical Gardens in Phoenix for all to see. Tanukis are Japanese raccoon dogs and dangos are Japanese dumplings (as I said in the post). 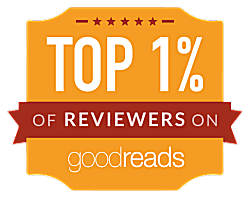 Whether or not there's more symbolism than that in the figures, I don't know. Wanting to know more about tanukis, I googled, of course, and found out that they are not raccoons, but are related to wolves and foxes. They are monogamous and the fathers help with parenting. They also hibernate during the winter, but with their partners. They are also part of Japan's folk-culture, known as shape-shifters. I knew there was much to these tanukis than meets the eye. Thanks for the additional info, Kathy.